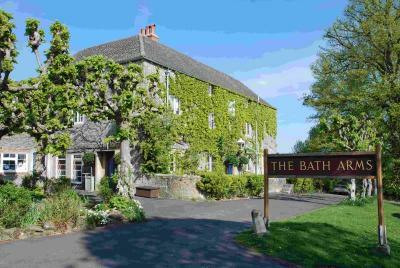 Lock in a great price for The Longleat Bath Arms – rated 8.6 by recent guests! Beautiful place to stay, rooms clean and staff were amazing. Breakfast included was amazing too! Best part was it was 2 min drive to longleat! Rooms are at a very good standard. Nice linen. Staff all very friendly and welcoming. Breakfast amazing. Best burger have had for a long time! Book think hotel last minute for a spontaneous trip away, didn't really look into it that much but at arrival we were blown away! It was so beautiful and romantic and the food was delicious and presented wonderfully! Breakfast was lovely room was very clean perfect location if you are going to longleat as we did. The staff were fantastic and the location was amazing. We travelled as we were going to Longleat and the hotel was only a 10 minute drive down the road to Longleat so the location was fantastic. We ate in a nearby village about 4 miles from the hotel and that was really nice. I would definitely recommend this hotel. The accommodation and location were great. The food was good especially the breakfast and the staff very friendly and helpful. The location exceeded expectations when we came to realise it is basically on the longleat estate! Also, the staff are all lovely and especially the lady who gave us a free bottle of water from the bar before a drive home! The Longleat Bath Arms This rating is a reflection of how the property compares to the industry standard when it comes to price, facilities and services available. It's based on a self-evaluation by the property. Use this rating to help choose your stay! One of our top picks in Warminster.This stylish bed and breakfast is located on the magnificent Longleat Estate, a 5 minute drive from Longleat Safari Park from Bath Arms park tickets are available direct from reception, a 24-hour notice is required. We serve seasonal locally sourced a la carte menus alongside as well as traditional pub food in our 2 AA Rosette-awarded restaurants. Each room at The Longleat Bath Arms uses lighting and color to create a unique individual design. They all have a flat-screen TV with digital channels, a DVD player, and free designer toiletries. With free parking on site, The Longleat Bath Arms sits in a picturesque area of unspoiled beauty. When would you like to stay at The Longleat Bath Arms? This room includes a private bathroom. It can accommodate up to 1 extra child (an extra charge applies). One of the rooms is a twin room and has a wet room. Allocation of this room is subject to prior request and availability. With a unique carved four-poster bed, this luxurious room has a private bathroom. It can accommodate up to 2 children (extra charges apply). This spacious room offers a private bathroom and some feature a stand-alone bath. It can accommodate up to 2 children (extra charges apply). This room features a flat-screen TV with DVD player, a view and electric kettle. It also has an private bathroom. House Rules The Longleat Bath Arms takes special requests – add in the next step! The Longleat Bath Arms accepts these cards and reserves the right to temporarily hold an amount prior to arrival. My error really as I didn't mention my daughter is disbaled so she found the winding stairs and uneven floor a bit tricky but it is a very old building so to be expected, next time and there definitely will be one we will ask for a ground floor room. The bedroom was really hot, and the bed itself was rather uncomfortable. A thin matres with a thin memory foam topper on, maybe could do with being replaced. You could hear the other guests walking around. It was in a beautiful location and the building was historic. The evening meal portions could have been larger. The bathroom was large with a strange layout. Door from room was less than 5ft high!. Fittings were not up to standard. Only shower facility was hand held shower attachment in free standing bath. Taps on hand basin were loose. Paint on bathroom carpet. Disappointing accommodation in the second of the two rooms booked, in an outside block, shabby, both room and particularly the bathroom need updating. Surprised to have been charged the same for both rooms considering the difference in standard. Rooms are clean and fine for a couple of nights, but are in annex, which is a converted barn, so a little strange in set up and you have to go outside to get into main building, which is not good when it is typically English weather. Excellent food in the restaurant and good breakfast aswell. Staff and bar very friendly. Location quiet and remote if you are looking for a peaceful stay, but not too far from Frome and Warmister by car. Amazing hotel. Lovely staff. Perfect breakfast! Don’t expect modern. This has a great country feel. Breakfast was brilliant and worth the trip on its own. Would highly recommend. Room temperature low on arrival and didn't increase noticeably, mentioned gap in window which caused cold draught.